Bronchiectasis results when inflammatory and infectious damage to the bronchial and bronchiolar walls leads to a vicious cycle of airway injury. On the basis of the classic characteristic, that is, permanent bronchial dilatation, bronchiectasis is generally considered irreversible in the adult population. In October 2017, a 21-year-old woman presented to our hospital with a 9-day history of productive cough and fever. There was no history of respiratory disease. A physical examination showed crackles at the right lower lobe and no clubbing of the fingers. A chest radiograph demonstrated ill-defined consolidation in the right lower lung field. 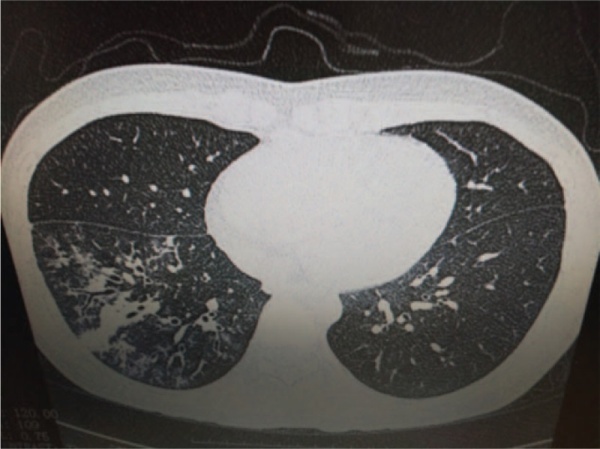 Chest HRCT scan showed patchy consolidations with cystic and cylindrical bronchiectasis in the right lower lobe. White blood cell count and neutrophils were normal. Hyperresponsive C-reactive protein 55 mg/L. Erythrocyte sedimentation rate 53 mm/1 h. The mycoplasma antibody titre rose from 1:320 on admission to &gt;1:1280 by day 5. A diagnosis of bronchiectasis was made, secondary to M pneumoniae pneumonia. On admission treatment with azithromycin and a mucus clearance regimen was started. She noted gradual improvement of her symptoms. A HRCT 7 days later demonstrated resolution of bronchial dilatation and absorption of the consolidations. She was discharged from hospital after a stay of 1 week. Sequential chest HRCT 1 month later showed complete resolution of bronchial dilatation.